Metro Exodus' first big patch, the Ranger Update, has arrived. 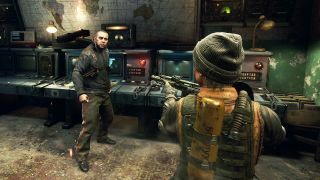 It promises to improve performance and squash bugs, adds Ukranian localisation and provides more support for RTX cards, but the headline attraction is the New Game + mode, available once you complete the game for the first time. New Game + lets you start a new playthrough with all the weapons and attachments you unlocked the first time around, saving you all the time you might otherwise have spent scouring the world for junk. As well as getting access to this arsenal, you'll be able to customise the game with a bunch of modes and settings. You can play with a one-weapon limitation, try your luck with no manual saving or give enemies a lot more grenades. Check out the full list of settings below. Allows you to start with all weapons and attachments found in the last playthrough. Weapons are granted after freeing Anna in Moscow. Starting weapons will be the last loadout that was set in the previous end game save. All other weapons and attachments previously unlocked will be available in the Aurora workbench armory, first encountered in Volga. Player armor/wrist upgrades do not carry over. Reduces weapon slots to one. Any weapon can be used in this slot, but you can only take one with you. Manage this by swapping weapons in the field, or by using the Aurora workbench armory. Crafting in the backpack is disabled, you may only use a workbench. Only weapon modifications allowed in backpack. Human NPCs are upgraded by one level of Armor across the game if applicable. Creatures have thicker hide across the game. Human NPCs use explosives more often. Change the game’s natural day/night cycle from 2 to 24 real hours for complete immersion. Fog, rain, snow, and sand storm conditions occur more frequently where applicable. Additional radiation zones will appear across some levels, making the gas mask more important. Fully disables the save system, progress is only saved between levels. Green tape players throughout the game will be available to play developer commentary about the area in which it is found. The update is live now, and you can read the full patch notes here.